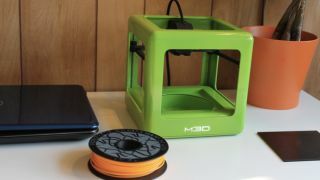 A Kickstarter project offering a compact 3D printer for just US$299 (about AU$322) has smashed its modest US$50,000 goal (AU$54,000) just minutes after going live on the crowd-funding site. Filament spools can be snapped up at the pledge stage for US$12 (about AU$12) a pop, making this an entirely affordable endeavour altogether. The company had been offering an early bird special printer US$199 (AU$214) for the those lucky 250 punters who spotted the listing in time. All told, backers have kicked in over US$460,000 (AU$496,000) on day one alone. Once they run out, Kickstarter backers will only be able to jump on board by chipping in US$599 (about AU$645) or more to secure a 3D printer from the initial batch.